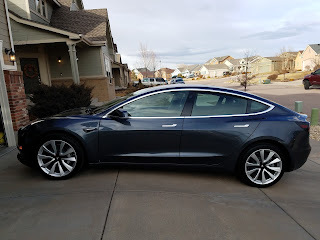 Colorado Springs EV Club: Our latest members! Rudy Gonzalez is a new member and he lives in Colorado Springs. He just purchased a 2018 metallic silver Tesla Model 3 after driving a Toyota Prius for 12 years. Please make him welcome! Jason Hall is a new member today, he is interested in the Mitsubishi Outlander PHEV. He is a Senior Advanced Energy Engineer, AEP at Colorado Springs Utilities. Michael Avanzi is a new member today, he is interested in the EVs in general. He is a Manager, Energy Planning & Standards at Colorado Springs Utilities. We all can thank Jason and Michael for the electricity it takes to run our cars! The Tesla Model Y is out! Know before you go electric!